El Nino has been pleasant to some and others it has left misery with the warm too hot weather and then back to the cold and windy and wet, snowy weather like this morning. A few years ago I was wanting something warm to eat on a day like this. I thought I would try and pull together stuff to make a soup. Now I will be the first to admit, I AM A SOUP FAN! I came up with a cream of potato soup which is very easy to make, and with a bit of time and trial and error it will be easy for you. So here is what you need. Dice up 6-7 slices of good bacon, and saute in a pan. cooking until a bit crispy. Take out and place on paper towel. Leave just a bit of the bacon grease in the pot because it is going to help and flavor the veggies you are getting ready to cut. Dice up 3 whole carrots, 3 stalks of celery, and one medium onion. Place into medium heated pan and start cooking on this yummy goodness! Take your spuds peel them, cut them into sticks, then dice them, then place in pan with all the other veggies and cook them for five minutes or so. Potatoes need salt and plenty of it. I use salt with no sodium, or sea salt and then freshly ground pepper and plenty of that also. Now add at least 6-8 cups of low sodium chicken or veggie broth to the pot. Now here is where I change it. I put milk in the pot instead maybe half milk have broth., Bring everything to a boil and cook for about 10 minutes or until the potatoes are tender. After that I take a ladle of the liquid and place in a bowl, then sprinkle some flour into the hot mixture and whisk it until smooth, keep doing this until thick then pour it back into the pot of broth. Now another option you may do is to place some good Cajun seasoning into the pot or since only a couple of us in the family like it with a kick, we lease that out and place the big jug of Louisiana Hot Sauce on the table. I also dump a can of sweet corn in the pot too. Now you can do one or two things. You can either ladle soup into a blender and bend it so the veggies are smaller, or do what I do, get a potato smasher and get after it. I enjoy a more hardy soap so i like it a bit more chunky. Let it simmer on low for about 10 to 20 minutes. In the mean time grate your favorite cheese and pull out some sour cream if you like. You can make some good cornbread or toast some ciabatta bread for the soup.Get some bowls ladle some soup into them. 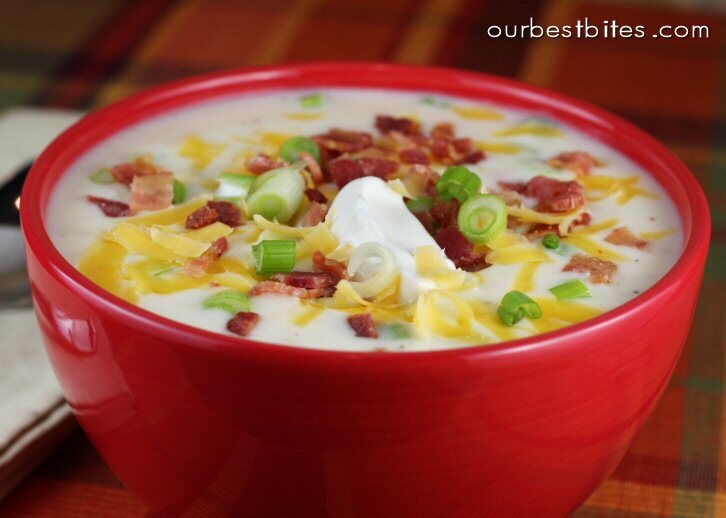 Cheese it, bacon it, sour cream it, say a blessing and warm your body and family up!